While tree pollen tends to cause hay fever in the early spring months, grass pollen is the main trigger for hay fever in the earlier summer months. Overall, grass pollen is the top offender for hay fever sufferers and the majority will be sensitive to grass pollen, although it varies depending on which country you live in. For those located in Britain, grass pollen is the common cause of hay fever symptoms. In particular, perennial rye and timothy grass are the main culprits. Generally, grass pollen is picked up by the wind, where it is blown into our eyes, ears and nose. 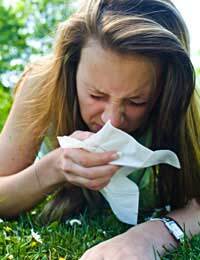 People who are sensitive to grass pollen will have an immune reaction, where they produce a chemical called histamine in response. The reaction is essentially a chain one; once the pollen is blown into the nose, cells release histamine, which encourages other cells to follow suit. Other chemicals that contribute to the allergic response are prostaglandin and leukotrienes. This results in the characteristic hay fever symptoms such as watery and bloodshot eyes, a runny nose, sneezing and an irritated throat. Grass pollen itself varies both seasonally and geographically. It's also affected by temperature, rain and as with other pollen bearers, the time of day. Despite the thousands of grass varieties, the number that actually causes hay fever symptoms is quite small. Statistically, it's likely that your hay fever symptoms will, in part, result from exposure to grass pollen. Your doctor will, however, probably still conduct allergy testing to confirm that grass pollen is a cause of your symptoms and he or she will check for an allergic response to other common allergens as well. Hay fever treatment is generally the same regardless of the irritant. The first line of defence is to minimise contact with the allergen. For those who are allergic to grass pollen, avoiding time outside when pollen counts are high-usually in the early morning and evening-can be helpful. Medications to treat hay fever caused by grass pollen will often include antihistamines, decongestants, anti-inflammatory drugs or immunotherapy. With immunotherapy, a controlled exposure to the allergen is performed, which is meant to build up the body's resistance. Grass pollen immunotherapy is usually not performed unless medications have proven unsuccessful. If you also suffer from asthma, grass pollen immunotherapy isn't usually recommended because it can trigger asthma attacks. The important thing to remember is that a grass pollen allergy must be treated, because if ignored, complications can arise. Common complications include secondary infections of the ears and nose. Although hay fever symptoms resulting from grass pollen can be very debilitating, try to remember that you're not alone. Many people suffer from the same allergic reaction to grass pollen. Due to the prevalence of hay fever, it is widely recognised in the medical community for the challenging and distressing condition that it is. There are many treatments available and once you have received a proper diagnosis from your doctor, you can find a manageable plan that allows you to avoid grass pollen whenever possible and treat symptoms as they occur.